Sew Slowly: AHIQ - Share your improv #3 and a finish! I thought I'd kick off today by sharing my hitherto unblogged quilt, which was a long time in the making but was finally finished last week. This is Small Pleasures. And a few wee details. hand quilted with four different variegated Sulky Blendable 12wt threads, two pinks, two blues and greens. The first fabric pull was done on 23rd January, and I sewed the last stitch on 14th November. It's a great pleasure to see this quilt, Kaja. The colors are scrumptious - all the richness of early summer/ late spring. There are so many details in the blocks - teapots, tumblers, log cabins. I'd love to hear more about your thought processes on this. What a beautiful quilt. I love its gypsy caravan look and would quite like to steal it! Wow. I guess the new owner is thrilled. It has so much life in it. When I knew the colours that were wanted I was sure the wow factor would be hard to achieve but it is there in loads. Super. What a wonderfully vibrant and colourful quilt. I love the pieced backing too! What a thrill to finally see your unblogged quilt! It is exciting and gorgeous Kaja! We're used to you showing us steps along the way, so I've been looking at Small Pleasures and imagining your process. The little details... teapots, log cabin blocks, fussy cutting (!!! LOL) and your wonderful hand quilting are all really wonderful! Catherine is right that it has a gypsy caravan vibe to it. The person who commissioned the quilt must be ecstatic! Well, this is gorgeous, Kaja! Right in my favourite colour range. :D I would love to see more of the details. I'll be back later today or tomorrow with my link! Congratulations on a beautiful finish. I'm using that color range (at least the warm colors) in my current rail fence quilt. The blue wants to be added, but I think I will save it for my leftovers quilt. Eye candy, Kaja. I love all about it! Wild and harmonic at the same time. Really delightful, I agree with Doris, 'Eye Candy'. That's what a good quilt is all about. Wow! Love the bits of dark blue and rich green you added! This quilt is an attention grabber. So rich and luscious. Beautiful work as usual! It is absolutely wonderful - so many layers and so much to look at. Fabulous! Wonderful wonderful finish! I have not been keeping up with the improv ..... but it is still in my mind....does that count for anything? Oh, how gorgeous! Shame on you for holding out on us until now! The color scheme is yummy and those teapots are the fun factor. And the quilting is icing on the cake. Congrats on that beauty! Such a beautiful richly coloured quilt - a real joy to see and one that needs time to be studied to find all those little details. 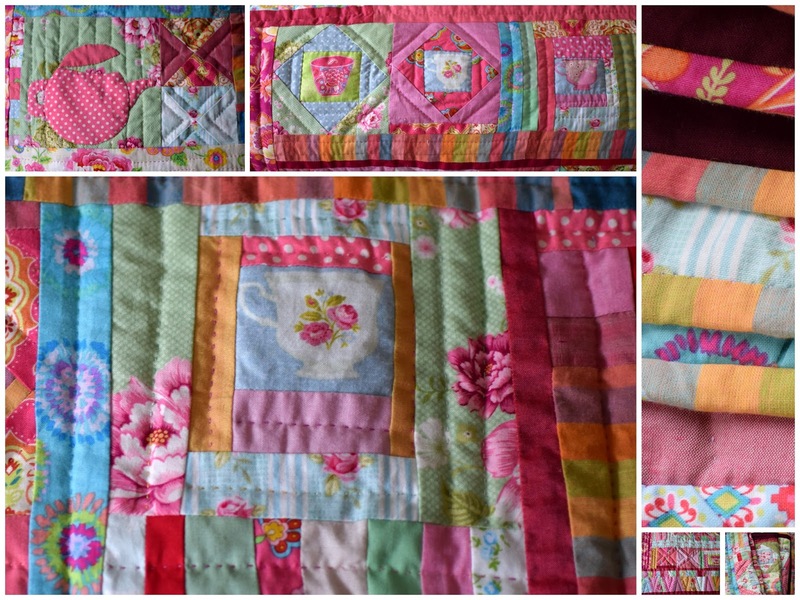 Oh this quilt is such a beauty Kaja! I'm continually inspired by your colour combinations! It's beautiful, Kaja!! You blended the colours and the fabrics wonderfully. You even hand quilted it, so amazing! Many Thanks to you, now I have made two improvised painting. They are small but it's a start. This is glorious, Kaja! I keep looking back and finding more details in it. The stronger colours give it more definition, it's just great!! Woohoo - again! Damn you Kaja - how many finishes is that this year, 3?!?! Gawd you put me to shame :D Did you start this as a kind of medallion? It's glorious - the palette reminds me of Kaffe Fasset, but it's all the better for being improv. Love the way the dark lines draw your eye around. Hope the recipient likes it? I'll have it if she doesn't!